During school vacations, I get dozens of emails from tired parents asking about chores that kids can do. We all agree that kids should help around the house, but it’s difficult to know what they should be doing. Here’s a news flash: kids can do a LOT more than you think. After all, just 100 years ago kids as young as nine were working 70-80 hours per week in factories! Now, I think we can all agree that’s not what we want for our kids, but the point is they aren’t as helpless as we sometimes think. In fact, we’re harming them by doing everything for them. Out of 1,001 adults surveyed in the U.S. by Braun Research, 82 percent had regular chores growing up, but only 28 percent said that they require the same of their children. Yes, it’s important for kids to have fun and explore, to socialize with peers, and enjoy a variety of activities and settings. But it’s just as important that they learn life skills. And do you know how they learn them? CHORES! 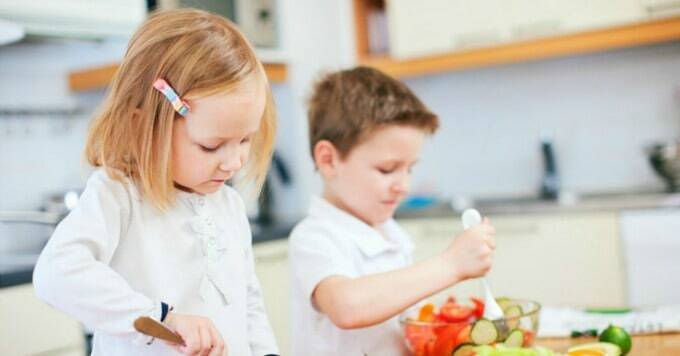 Pitching in around the house teaches kids the basics of cleaning, organizing, and even cooking — all things they’ll need to do for themselves one day. After all, they don’t suddenly learn such things the day they turn 18 and move out of the house. 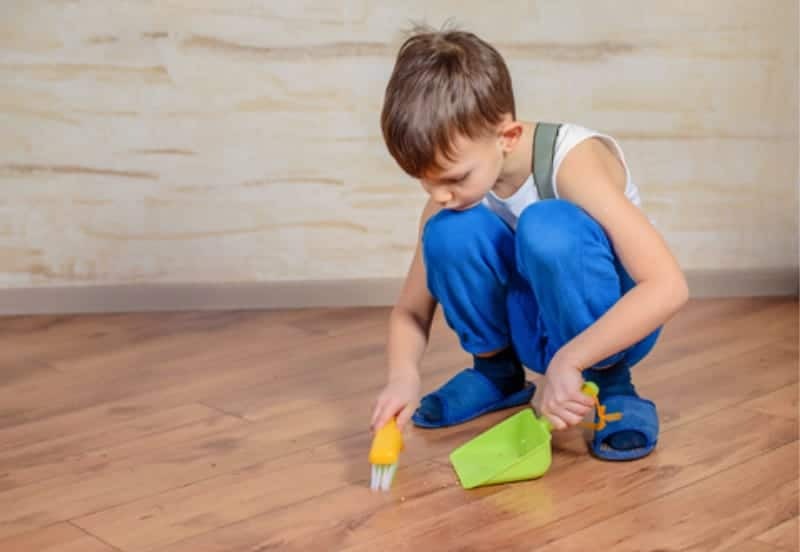 Kids learn by having to do chores while they’re younger, with parents around to help explain the steps involved and to show them how to correct mistakes. Seriously, you do not want your kid trying to learn how to run a dishwasher or broil a fish in the oven for the first time in their own apartment. That’s how floods and fires start, people. Beyond learning skills, kids who do chores also learn a work ethic critical to their future success. Having to finish chores before playing teaches kids that they must fulfill their responsibilities to earn their free time. Kids who grow up doing chores at home learn the skills they need for success in college and their early careers, get along better with others, and are more self-sufficient adults. Besides, giving kids chores means that Mom and Dad have more free time to spend with them. See? Everyone benefits. As kids grow older, they grow more capable, too. 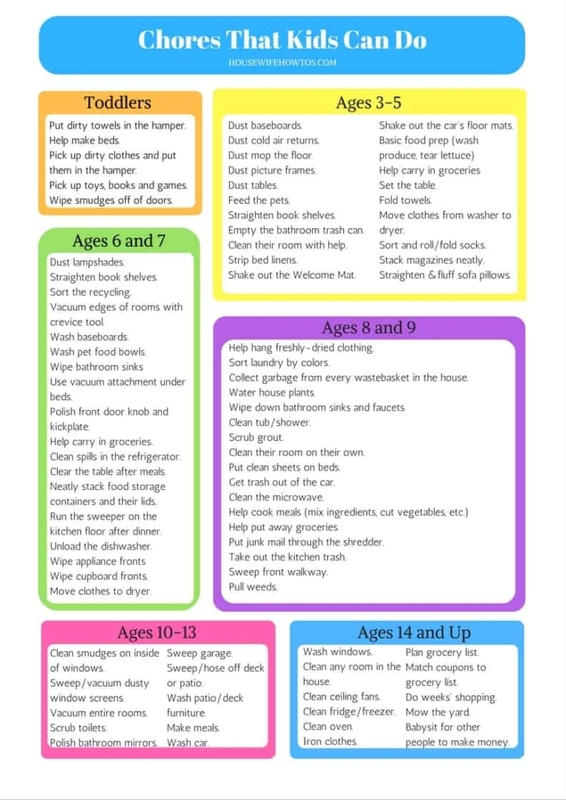 So, in addition to the chores listed under their age group, they should have mastered the tasks from earlier years. 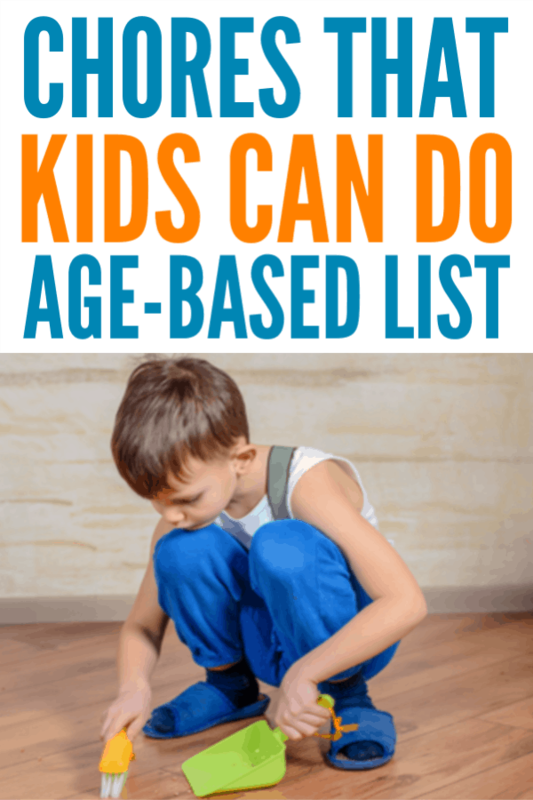 If you’re just starting to teach your child chores, begin with ones from an earlier age group and add more responsibilities as they become more confident and able. Pick up dirty clothes and put them in the hamper. Pick up toys, books and games. Wipe smudges off of doors. Empty the bathroom trash can. Clean their room with help. Shake out the Welcome Mat. Shake out the car’s floor mats. Vacuum edges of rooms with the crevice tool. Use vacuum attachment under beds. Polish front door knob and kickplate. Clean spills in the refrigerator. Neatly stack food storage containers and their lids. Run the sweeper on the kitchen floor after dinner. Move clothes from washer to dryer. Collect garbage from every wastebasket in the house. Wipe down bathroom sinks and faucets. Clean their room on their own. Put clean sheets on beds. Get trash out of the car. Put junk mail through the shredder. Take out the kitchen trash. Clean smudges on the inside of windows. Sweep/hose off deck or patio. Clean any room in the house. Babysit for other people for money. Okay, that last one I’m not willing to trust my teenager with just yet, but let me tell you that it was a real treat the first time my adult daughter made one for each of us! Click to open .pdf for printing or right-click to save and print later. Hi Katie! I’ve been looking for something like this for a while. Although my kids can do the basics I’ve been wondering just how much I should be putting onto them. I was doing quite a lot at 8 years of age but my children, aged 12 and 10, still only do the basics. Not anymore! LOL Thanks for linking up to Thriving on Thursdays last week. I’m featuring your post at tomorrow’s party. Thank you for the list. I didn’t know there are so many I can assign to them ha ha. These won’t keep them bored with chores. Thank you, Camille! This is going to sound odd, but… when I got my puppy, she was into everything all. of. the. time. A professional dog trainer told me that “a tired puppy is a good puppy,” and advised me to wear her out with an hour of walks and games in the morning. Well, boy, did that work! The same goes with kids…to some extent. Kids who do chores get to work off the excess energy we used to be able to burn off playing outside, unsupervised, back in the day. My youngest is now driving (!) and, like many teens, can get snarky and sullen if he’s not busy. I’ve started loading him up with chores — from which he earns gas money, as well as pocket change — and it has made SUCH a difference. I love this! I believe children learning to be apart of the family and working together is so extremely important. Even more so in this Me Me world we like in, Love these ideas!!! I couldn’t agree more, Lindsay! Plus, giving kids chores teaches them skills they’ll need when they get out on their own. Since our goal as parents is to raise productive, responsible adults, that’s a good thing! This is a great list! I know we’re too easy on our kids (something I’m trying to fix). This is a great place to reference for creating chore lists. Thanks! We have been slacking off in my house so I am definitely printing this chart as a reminder! Visiting from Share it One More Time. Hi there – absolutely loving this site. as a harried and organizationally challenged mom who works outside the home, this is really helpful! Would you consider formatting the “Chores Kids Can Do”, and “One Minute Chores” series into cute printables l? That’s a great list! There are some on there I haven’t tried with my boys yet. Pinning! Funny how history repeats itself and I did the same with my children and now with my grandchildren when they are here during the summer months. Children learn quickly that when they chip in there’s lots more time for fun! It took my son a long time to learn that lesson, but I’m sure glad he finally did. Of course, his real motivation came from wanting to earn money to buy video games, but then he realized I had more free time — and would play the games with him — because he’d helped.